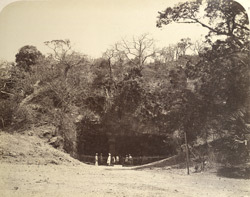 This photograph on the island of Elephanta was taken in the 1860s to form part of an album entitled 'Photographs of India and Overland Route'. The rock-cut cave of Elephanta is dedicated to Shiva and was excavated in the mid-sixth century. The sanctuary is entered through openings on the east, north and west and consists of a large hypostyle hall containing the linga shrine, Shiva's symbol, and two external courtyards. The cave is decorated with large sculptural panels depicting various aspects of the god.